Three countries, 12 days, and over a hundred inspiring African experiences. Hop across Southern Africa for intimate safari moments, charming outdoor adventures, and surreal moments in the wilderness. 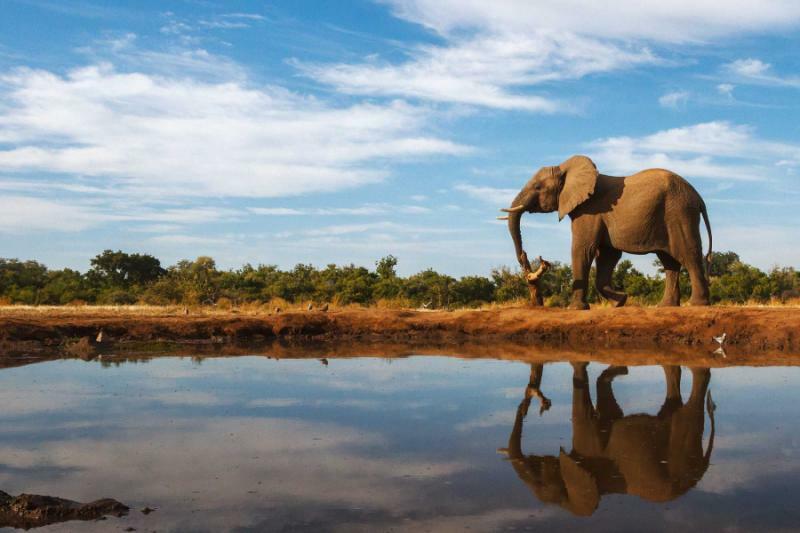 From rhino walking to historic vineyards, canoe safari to Victoria Falls, this African Safari itinerary captures the iconic essence of the region, taking you from Cape Town to Botswana to Zambia. You explore the colorful diversity while also submerging yourself in destinations filled with famous wild game. Southern Africa is filled with nature's pleasures. Rhinos wandering wild within earshot of Victoria Falls, vast elephant herds crossing lush river channels, penguins basking on beaches beside Cape Town city. There's always an inspiring view, whether you're gazing out across the Atlantic Ocean from Table Mountain, or watching buffalo herds from a luxury camp verandah. Every view and every destination are very different, each presenting another side of a mystical continent. This African Safari itinerary has been handcrafted to fuse the disparate destinations, taking you to three countries in just 12 days. Experience the colors and charms of South Africa, get lost in the wilderness of Botswana and feel nature's powerful presence in Zambia. Local flights provide easy connections, so the itinerary isn't rushed, especially when downtime at the lodge includes watching a procession of big game wander past. In less than two weeks, you get an authentic snapshot of Southern Africa, one that's packed with its iconic highlights. 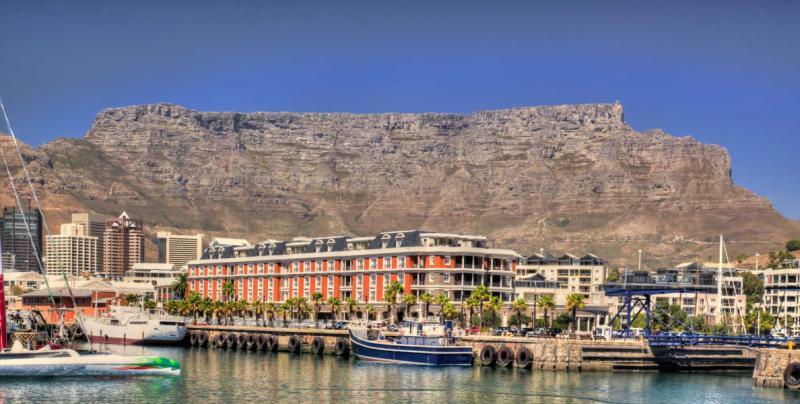 Start in Cape Town, the city flanked by Table Mountain and one that radiates a vibrant atmosphere. Nature defines the city, with towering peaks and ocean views an unmistakable highlight. 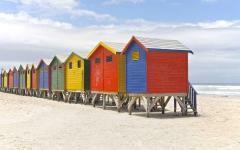 Spend three days exploring, including a journey through the Cape Winelands and a day on the Cape Peninsula. Think wild penguins on the beach, meeting vineyard owners, fabulous restaurants, and thousands of friendly faces. 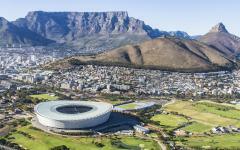 The city is an ideal starting point in Africa, a showcase of both natural splendor and welcoming culture. 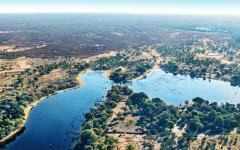 Fly to Maun, and transfer onto a small plane for a scenic flight above the Okavango Delta. Your Botswana safari experience is split across two destinations, starting with the waterways of this gargantuan oasis in the desert. 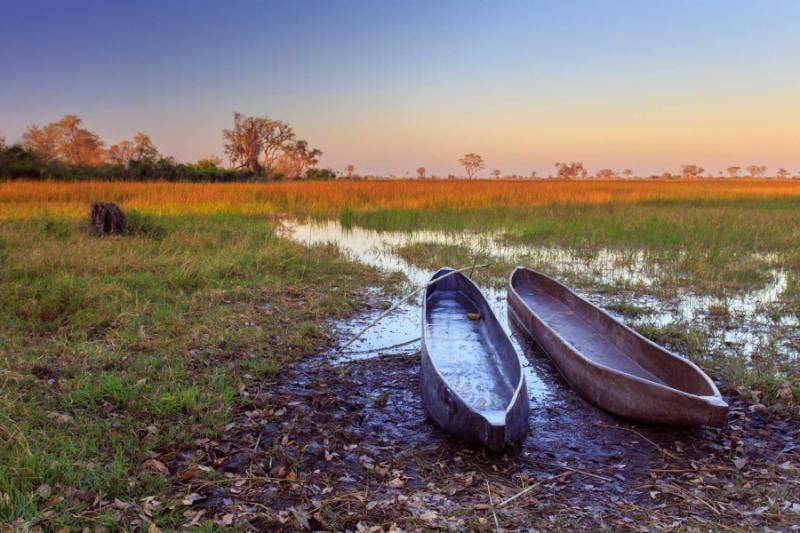 Take a canoe safari through channels filled with hippo pods, game drive through wildlife abundance, and sit back and listen to the natural soundtrack of the wild. Another micro flight brings you to Linyanti, a thrilling private concession that epitomizes the diversity and intimacy of African safari. There's a chance to go on a walking safari and enjoy nighttime game drives during your two days here, along with more classic safari activities. Don't think about glimpsing merely a few animals. Think of being amongst tens of thousands of elephants, all the big cats, and a succession of Africa's great mammals. The only mammal missing from the Botswana safari is the rhino. So when you hop to Livingstone in Zambia, you enjoy a half-day rhino-walking safari. With the great mammals resting in the afternoon sun, you're guided on foot to within ten meters of them. It's an experience that wonderfully portrays their size. 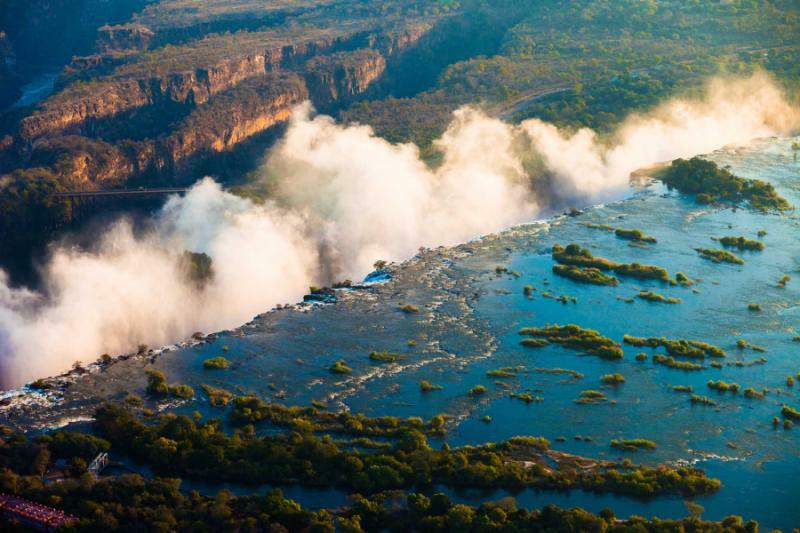 Livingstone is also the base for visiting Victoria Falls, and you'll be able to hear the world's most powerful waterfall from your lodge along the Zambezi River. 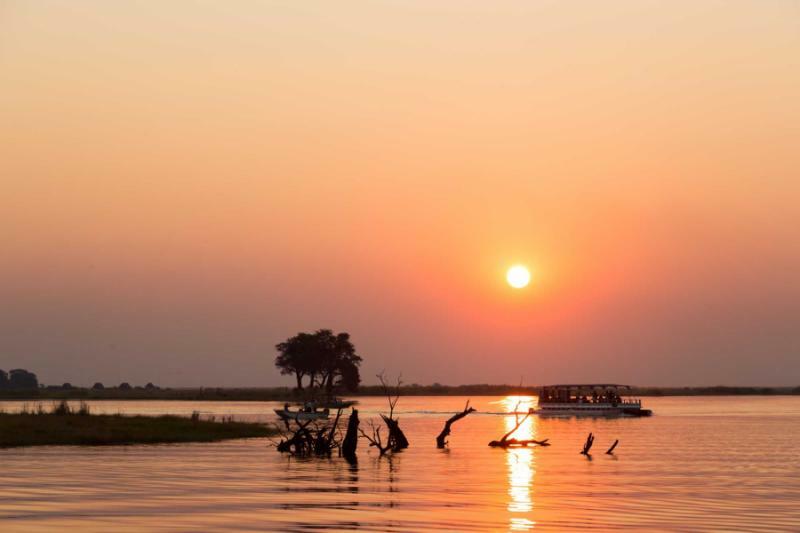 Monkeys swing around; hippos occasionally appear from the river, and like every day on this itinerary, there are hundreds of panoramas that seem to symbolize the raw essence of the continent. 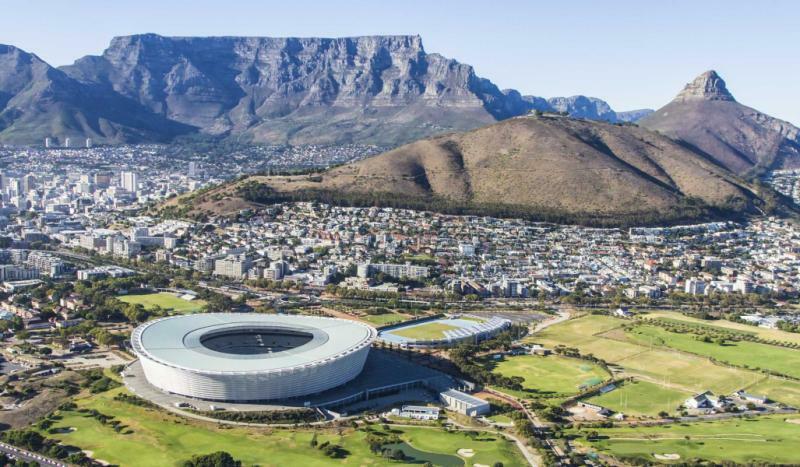 Land in Cape Town and Table Mountain is unmissable. As you're transferred from the airport, an iconic postcard image comes into view, the mountain standing proudly above the ocean and a city of colors. This natural backdrop seems to imbue a relaxed atmosphere, one that pervades throughout the city and then stretches northwards across the continent. Nothing is rushed in Africa. And even when you're in the city, it's easy to unwind. The rest of today is left free, and you'll probably want to head straight for a couple of famous attractions. The Waterfront area offers sublime ocean views and many of the city's finest restaurants. 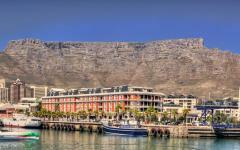 Or a revolving cable car takes you to the summit of Table Mountain for views that stretch almost to the tip of Africa. Should the iconic tablecloth of mist descend upon the mountain, it's just a 15-minute taxi journey to Signal Hill, where you get a 360-degree view of an ocean sunset, Table Mountain rolling mist, and city lights slowly flickering on. Consider reading some of our travelers' safari reviews of Africa to gain inspiration as to how to further refine and perfect your own African Safari experience. 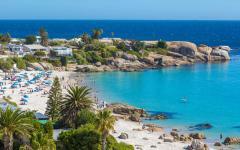 The southwestern tip of Africa offers a paradoxical landscape. Mountains rise dramatically, as the rugged peaks present an air of indomitability. The beaches are soft and serene, gaping expanses that are quiet, bar for the antics of penguins. With a private guide, you head south along Chapman's Peak Drive, a road that seems to cling precariously to the edge of Africa. 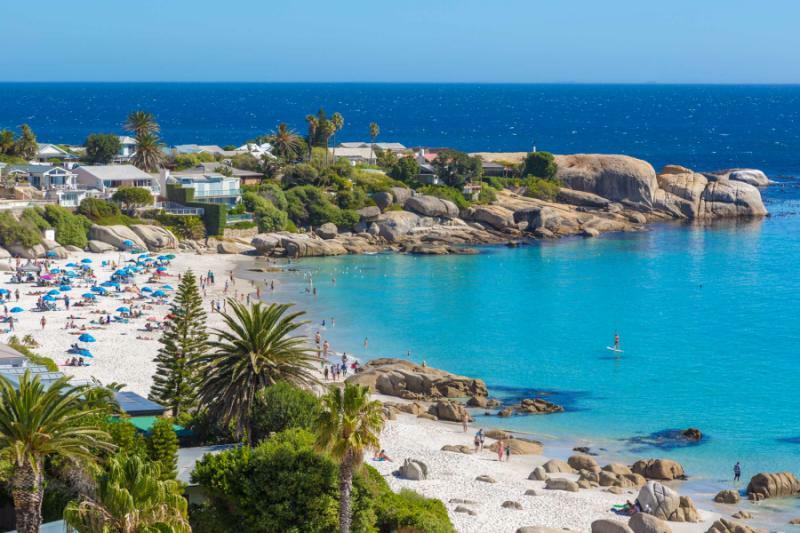 Soak up the atmosphere of fishing village Hout Bay, admire the waddling penguins at Boulders Beach, cross the fynbos of the Cape Peninsula, and stand at the lighthouse that marks the tip of the continent. There are so many viewpoints it's difficult to decide when to stop for the perfect picture, as this journey takes you around the Table Mountain chain and often gazing out onto wild dolphins and seals. 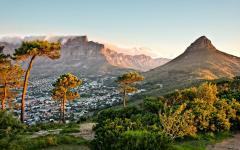 Return to Cape Town in the late afternoon, where the evening is free to enjoy the city. 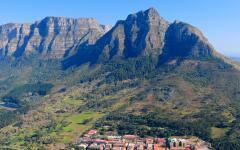 South Africa's wine region is discovered less than an hour from Cape Town. Hundreds of vineyards cascade beneath surreal mountain peaks, filling the valleys with an irrefutable sense of green. Your private Winelands tour will be tailored to your tastes. Sample the bubbles and delicate tastes of local Chenin Blanc. Smell the full-bodied scents of Pinotage, South Africa's own red grape. Sit at lavish vineyards with uninterrupted views over the historic town of Stellenbosch. Wander through rustic cellars, meet the winemakers, and enjoy a lavish lunch that complements the wine tasting. From world-renowned exporters to tiny 200-year old boutiques, a Cape Winelands tour can always be tailored to your exacting tastes. 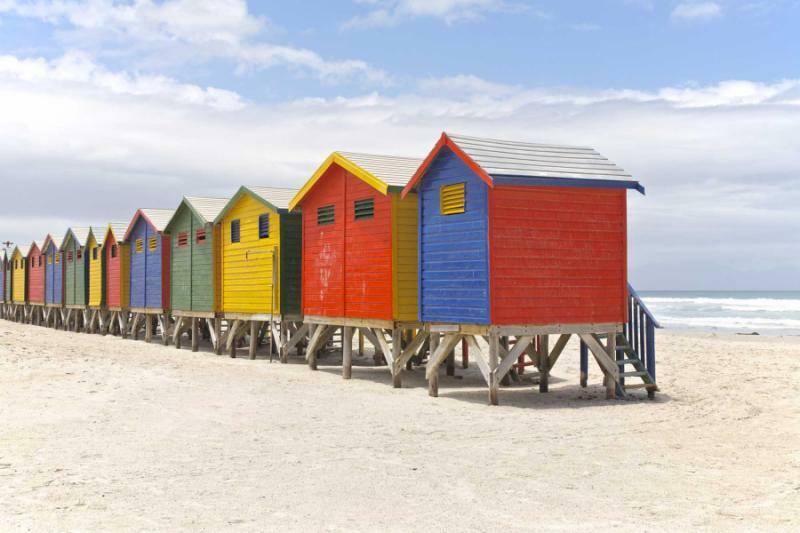 Return to Cape Town for a final night to enjoy the city's atmosphere and watch the sun set over the Atlantic. Flying over the Okavango Delta is one of Africa's eternal experiences. After a scheduled flight to Maun, you transfer to a light aircraft that swoops above nature's oasis. The dusty yellow of the Kalahari Desert bursts into a rich expanse of green and blue, with the delta's channels creating thousands of animal-covered islands. Upon landing, the sense of escapism is unmissable. 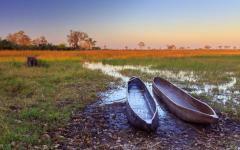 The runway alone is enough to showcase just how remote and wild the Okavango Delta can be. 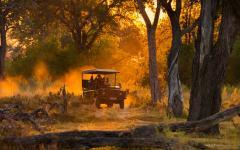 You're picked up in a safari vehicle and spend the late afternoon on a game drive through the area. First impressions are timeless: an elephant herd bathing in the river, a lion pride lounging in the shade, antelopes skipping across the horizon. Upon arriving at the camp, the safari doesn't end. For the next four days you'll be sleeping amongst the animal kingdom, a continual procession of wild game roaming past as you're immersed in the wilderness. The grass rises high and the sounds of nature echo throughout the trees. You can always sense the presence of wildlife in the Okavango, yet sometimes you need to move like the animals to see it. As the burning African sun appears on the horizon, you head out in a Mokoro, a traditional canoe with an expert gondolier. Wildlife is active at this time, splashing and drinking from the river channels. Paddle past a leopard as it sips from the riverbank, watch a large herd of buffalo as they come for a morning dip, and sense the uneasy calm when impalas tentatively drink. On a Mokoro, you can go ten minutes without seeing anything but strange exotic birds. But turn a corner, and there's a huge hippo pod filling the river, or a herd of zebra excitedly jumping down the river. Return to the lodge for a hearty lunch and some downtime through the early afternoon. 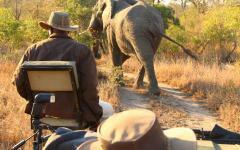 Then there's a choice of safari activities to continue your immersion. Game drives enable you to cover a large distance while walking safaris provide an intimacy amongst the evocative landscape. Reedbuck jump around, a cheetah emerges from the flourishing grass, while the nighttime is filled with a meandering soundtrack. Hippos grunt, elephants release trumpet calls, and the occasional lion roar keeps everyone excited. Then there are the soft sounds, like a parrot in the nearby acacia tree or the grazing of a springbok herd just a few meters away. With an African safari, you open all your senses to nature, even when you've retired for the night. 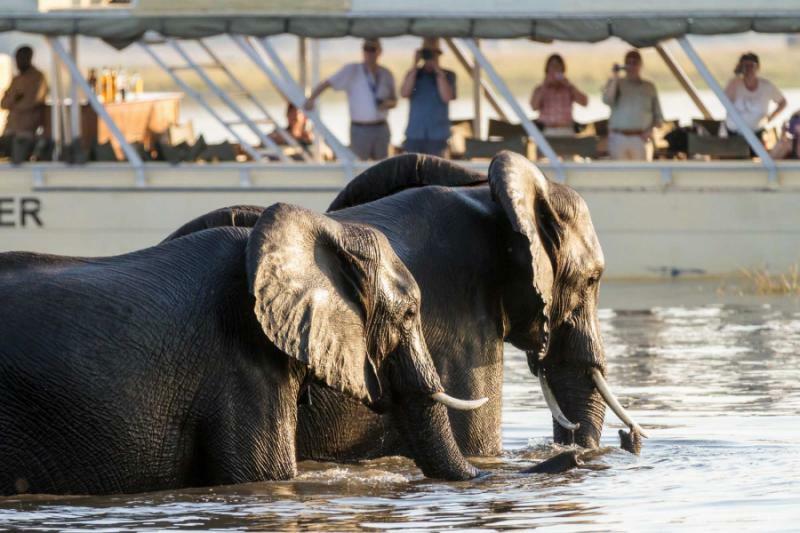 Okavango introduces you to Africa's safari scale, slowly unraveling just how much wildlife there is in Botswana. This impression continues on your second micro flight. You continue north, soaring above the Delta and admiring how it blurs into the thick forests of Chobe National Park. Your destination is Linyanti, a private concession that shares unfenced borders with Chobe and is on the elephant migration route to the Okavango. Touch down and within moments, you're encountering huge elephant herds, thousands of the great pachyderms barging a path through the forest. Giraffes are equally unmistakable, with hundreds of necks extending above the horizon. And when the forest flickers, remember to look closely, because a great abundance of predators can be found in Linyanti. Unlike the Okavango, Linyanti is a private concession, meaning access is restricted to the handful of guests staying at the camp. So it's rare that you see another vehicle or tourist in the savannah. There are also fewer rules here. On a game drive, you can leave the trail; spot a lion kill and you can get to within a few meters of jaws crunching into black and white skin; roam past elephants that tower above the safari vehicle, and stop beside rivers filled with hippos. There's an enhanced intimacy, one that encourages you to explore slowly and take in the enchantment that's imbued in every scene. And remember, Linyanti isn't a fenced reserve. It's a private part of a huge ecosystem that's home to virtually all of Africa's great mammals. Over these two days in Linyanti, you're free to build your own safari itinerary. 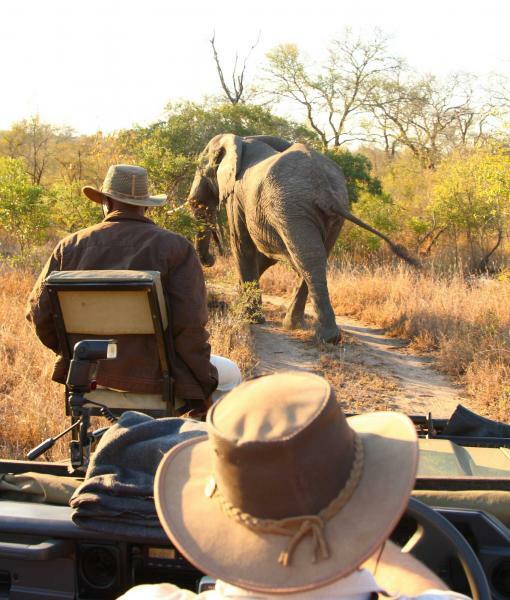 Elegant and exhilarating, a walking safari allows you to experience the raw thrills of the landscape. Game drives are the premier means of seeking out the most revered scenes, like cats in predatory mode and tense encounters at a waterhole. Travel along the river for an afternoon of charm; just lie back and watch the mammals come to drink. And you always continue the safari at the camp. Even from your bed, it's possible to watch Africa's great animals wander past. By combining two destinations and spending four days on safari, you can blend the range of experiences and activities, each providing a new angle of drama and charm. Then just when you think it's over, the guard softly grabs your attention and points to two lions mating barely 30 meters from the camp. It's all very safe; after all, the locals have been living alongside the big cats for centuries. It never fails to make you feel alive. As the African journey continues, you enter a third country. Zambia is vast and rural, a place of tradition, conjuring dreamy images of ancient Africa. 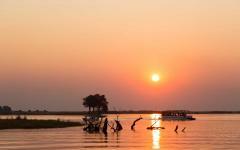 Fly to Livingstone via Kasane and you're transferred to a lodge along the Zambezi River. 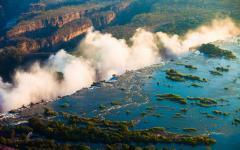 Listen closely and you can hear the roar of Victoria Falls, its monotonous rumble stretching out for miles around. Tomorrow you'll see it. But today you're left to savor its powerful presence. After lunch at the lodge, head out on a late afternoon river cruise. 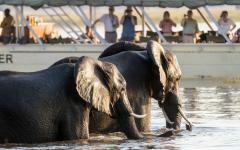 Relax and sip wine on the deck as you cruise down the Zambezi, passing various pods of hippos and slumbering crocodiles. 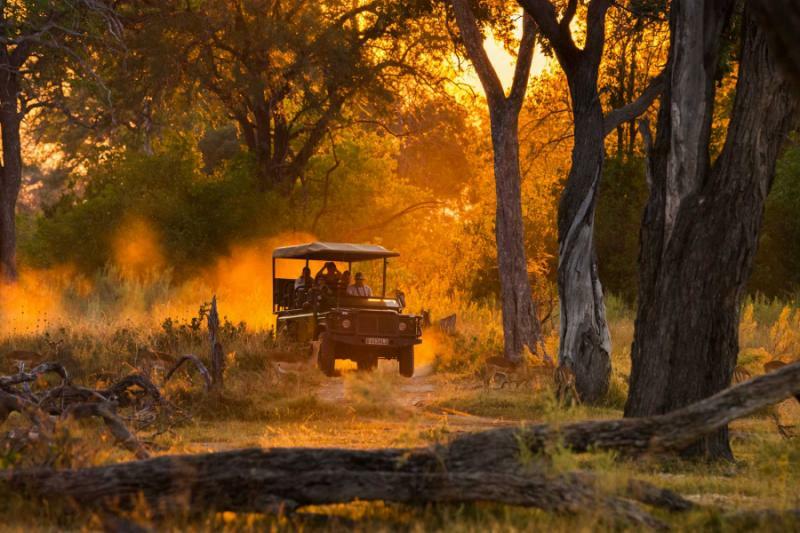 As with South Africa and Botswana, you continue your journey through nature, while also enjoying the old-world luxury that can be found in Africa. The decibels rise, and the roar comes closer. You can see the spray and hear the power but still the falls are hidden. Then you see it, first through the awning of trees and then more openly. Here are the falls in their uninterrupted glory. 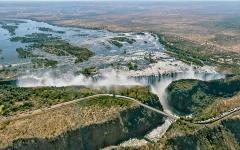 Victoria Falls are the world's most powerful; more water drops over the edge here than anywhere else. Estimates are that 1000 liters descend into the abyss, every single second. Wander along the narrow bridges to the cataracts and you can experience the falls from various angles. From August to February, the views are spectacular. During the rest of the year, the powerful spray interrupts the vistas but creates an unforgettable sense of nature's power. The walking trails are easy to manage, and you can explore unguided. Then in the afternoon, you capture its scale with a helicopter sightseeing flight. 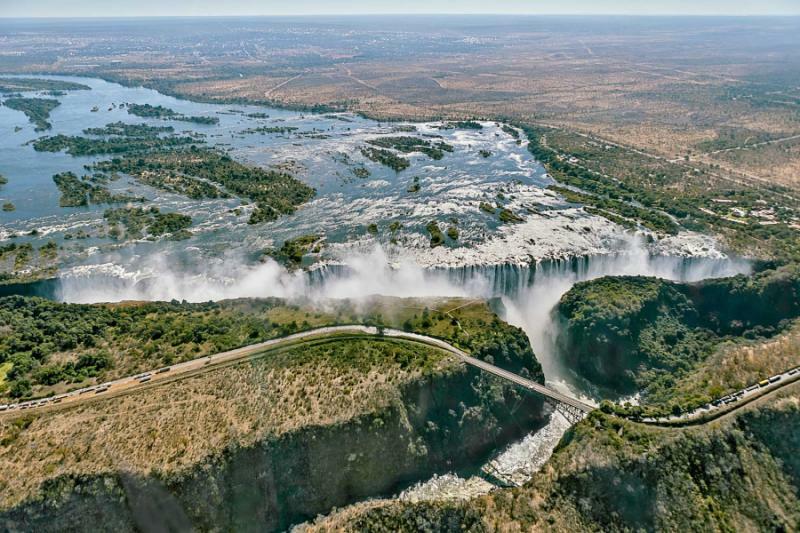 From the air, you admire how the chasm absorbs the Zambezi waters, and the falls provide a dramatic boundary between Zambia and Zimbabwe. Return to the lodge for a second serene evening overlooking the river. Over the four days of safari, one famous animal was missing: the rhino. Critically endangered, the great horned mammals are one of Africa's hardest spots. But not in Mosi au Tunya National Park. While a few elephants and a myriad of antelope roam the landscape, the game drives here are nothing like your experience in Botswana. However, a step from the vehicle and armed rangers take you quietly through the bush. Staying downwind and staying calm, you can walk to within ten meters of a group of white rhinos. They look big from a safari vehicle. Imagine how big they look when you're standing beside them. After this morning excursion, the rest of your day is free to relax along the Zambezi. You could choose a kayak safari or walk to a local village. Or you could sit back and watch the hippos rumble past. Livingstone's airport is convenient for your return flights. It's a short aerial hop to Johannesburg, where you connect with your international departure back home.